Sometimes I'm surprised at the versatility of certain food products. Like a simple block of cream cheese, for example. Besides all of the obvious bagelicious uses, the number of dessert-related things you can do with cream cheese are infinite, and they all score extremely high on my deliciousness scale. Cream cheese desserts, to me, often have that highly desirable, elusive, and seemingly contradictory combination of light and rich at the same time, which I love in a dessert. At first I was skeptical about the chocolate cookie crust with the rest of the flavors. But who am I kidding? Chocolate cookie crust? White chocolate? Lime? Cheesecake? Sold. Oh! And did I mention you don't even have to turn the oven on? 1. Line 8x8x2-inch square baking pan with foil, extending over all sides. Stir chopped white chocolate in small metal bowl set over saucepan of barely simmering water until melted and smooth. Remove bowl from over water. Finely grind cookies in processor. Add 2 tablespoons melted white chocolate and blend until mixture clumps together. Firmly press mixture onto bottom of prepared pan. Chill while making filling. 2. Beat whipping cream in medium bowl until peaks form. Beat cream cheese, sugar, lime juice, and lime peel in large bowl until smooth. Beat in remaining melted white chocolate. Fold in whipped cream in 2 additions; spread over prepared crust. Chill until filling is slightly firm, at least 2 hours. Using foil as aid, lift cheesecake out of pan. Cut bars into desired sizes. Garnish with lime zest and chill until ready to use. Yuuuum! I don't really bake anymore because I'm trying to battle my newlywed weight gain, but I *do* bake if I am able to take the goodies out of my house. These treats seem like the perfect summer dessert for my book club! Bonus: no need to turn on the oven. Thanks for sharing! you're right--cream cheese is the ultimate in versatile ingredients and i hadn't really considered that until now! your bars look really luscious to this white chocolate fan! was wondering if u used oreo cookies for the chocolate sandwich cookies bit? If you did, did u remove the centre cream filling? I did use Oreos, including the filling. It gets somewhat absorbed when you grind the cookies and helps bind them together as a crust. Wow, I hadn't really considered that until now! your bars look really luscious to this white chocolate fan! thanx for the post. I made these one year on the fourth of July and they were an especially BIG hit with my young cousins. Anyways, thanks for the recipe. This sounds really good. I love white chocolate, lime AND mousse!! I can't wait to try this one. Thank you! I really can't resist cakes and thats why i love to search and hunting recipes like this.Thank you for sharing an d posting you ideas. Loved this recipe! Fast and easy to make, and tastes wonderful. I didn't even use any of the toppings. Wow! White chocolates? I love it! I like cakes very muccchhh..Would love to have it and eat it the whole day. Thanks for sharing. This recipe was very easy for a cheesecake type desert. 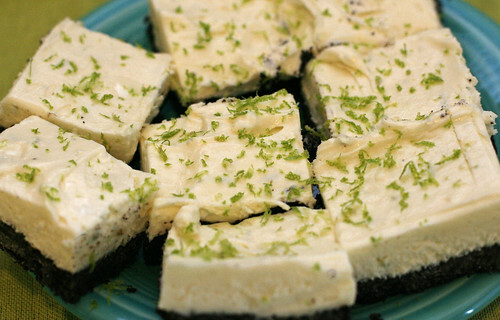 I add a teaspoon of lime zest and it was perfect!